There’s no better way to celebrate the union of two people in love than to have a morning wedding. The coming of the morning brings hope and promise, and for Tori and Brandon Feeney of Riverview, Florida, the best way to enjoy it was to have an outdoor wedding on the beach. From the beautiful ocean backdrop to fun and flirty camera poses with each other and the wedding party, this wedding was filled with a lighthearted attitude that can only come with a beach wedding. 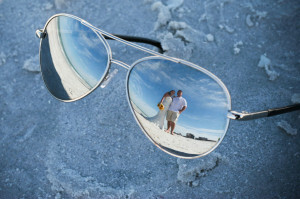 They hired Sarasota engagement photographer Catie Sweeney of PixelArt Photography to capture the event. For Tori and Brandon, who were engaged in Paris, The Plaza Beach Resort Hotel at St. Pete Beach was the perfect setting for their morning beach wedding. 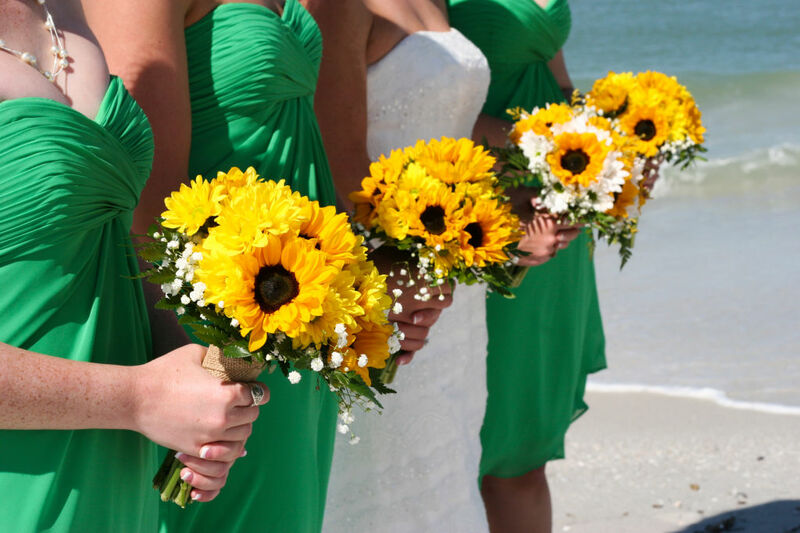 Having a morning wedding on May 17th, 2014, came with a number of advantages, from snacking on delicious donuts to enjoying personalized robes for the bride, her bridesmaids, and the maid of honor. As the guests began to arrive and the wedding party made their preparations, a white archway adorned with daisies was set up on the sparkling white sand, along with comfortable tables and chairs for the guests. 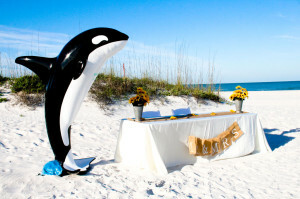 A black-and-white killer whale statue near the tables added a touch of fun and whimsy to the scene. When the guests arrived, a hand-painted sign directed them to remove their shoes while it pointed the way to the wedding with the words: “Shoes here, vows there, love everywhere!” These were just a few of the small touches that helped to set the scene for Tori and Brandon’s special day. One of the details that made Tori and Brandon’s beach wedding stand out was the personalized touches that were added to the occasion. When the guests first arrived at the tables that were set up on the beach, they were treated to personalized beverage containers with the bride and groom’s name on them. 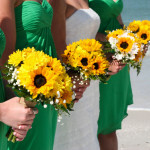 Not only were these cups the same color theme as the rest of the wedding, which was a light green with yellow daisy accents, but they came with lids and straws to keep sand out of the drinks when ocean breezes blew. Instead of signing a traditional guestbook, guests scrawled personalized greetings, well wishes, and signatures on a large white custom wood piece of scrolled artwork that the couple could hang in their home after the wedding. A custom cake topper and a “Mr. & Mrs.” banner at the bride and groom’s table on the beach added the finishing personalized touches that made this celebration so special. Although the bride wore a traditional white wedding gown and a strand of pearls for a touch of elegance, the couple’s photos were anything but ordinary. From amusing poses with the wedding party to candid shots together, Tori and Brandon struck poses whenever possible, taking advantage of the gorgeous ocean backdrop and beach-themed furniture. Before the ceremony, the bride and groom took special “eyes off” shots at the hotel, where the bride stood on an upper balcony and the groom stood below so neither could see the other. This mix of traditional and amusing photos was a perfect fit for this budget beach wedding, where it seemed like anything could happen! Two of the most enjoyable moments of a wedding are the tossing of the bride’s bouquet and the throwing of her garter, and at Tori and Brandon’s wedding, these moments were even more enjoyable because of the whimsical beach setting. The bridesmaids and groomsmen chased after the bouquet and the garter in their bare feet across the soft white sand, giving the photos of this event an even more playful air. The traditional wedding dances also took place right on the beach, and the backdrop of pure white sand only enhanced the bride and groom’s clothing as they danced with their family and with each other. The salt sea air, glittering white sand, and blue skies made this a wedding to remember for everyone who attended, proving that a wedding doesn’t need to be steeped in tradition in order to be special. As Tori and Brandon Feeney proved, all you need is the love of friends and family and a commitment to each other in order to make a wedding unforgettable. Summary: An early morning wedding on the shores of St. Pete’s Beach made the wedding of Tori and Brandon Feeney an event to remember for everyone who attended.